This info applies to the Neutrik RX series XLRs like NC3FRX and NC3MRX and other variations. This info can be used when placing an order and specifying the angle or to modifying the angle of the connectors you already have. 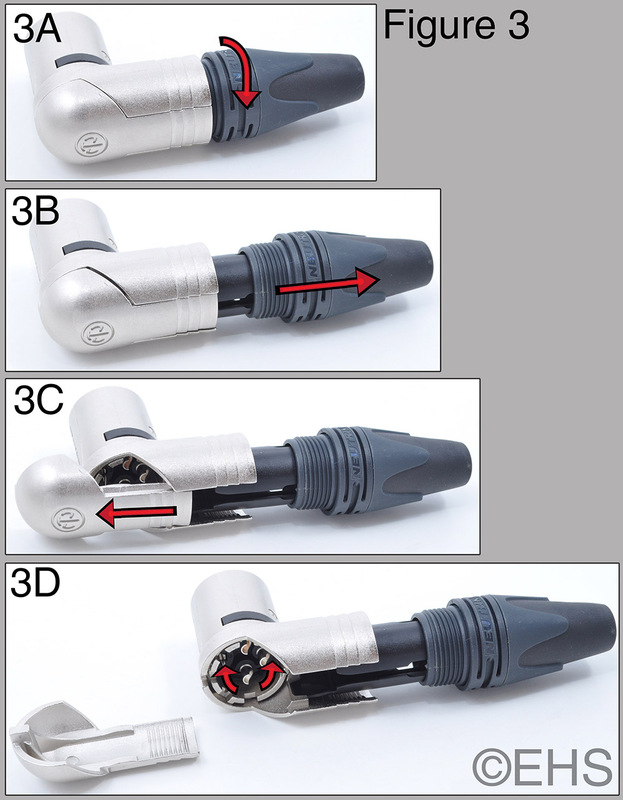 The factory XLR has 5 different positions that it can be set in 45deg increments. 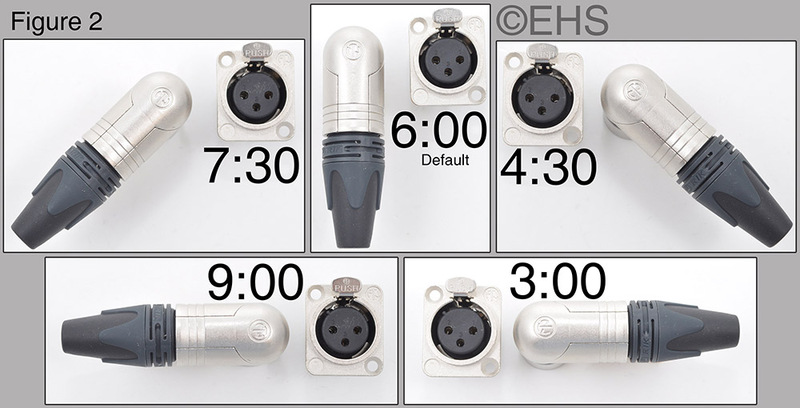 We have defined them as 270 degree, 315 degree, 0 degree, 45 degree, and 90 degree with 0 degree being the standard with the cable outlet being at the side of pin 3. Figure 1 shows the angles of the XLR with the red area being non-factory positions and the purple notch being the location to dissemble the housing. Figure 2 shows another representation of the factory options for better clarity. 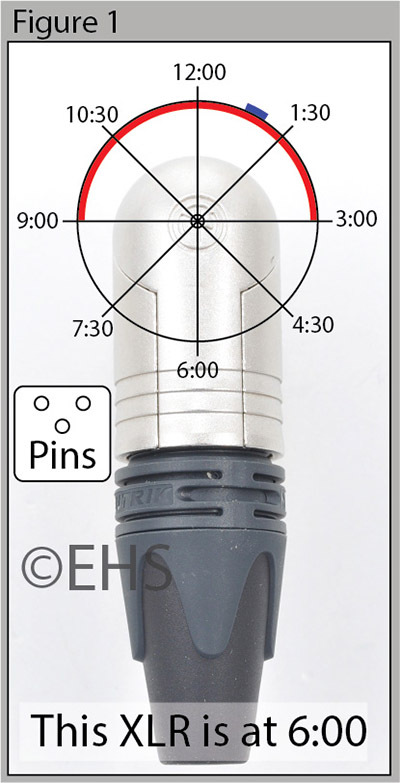 When a right angle XLR is ordered if no special instructions are provided we use the 0 degree notch for assembly. When ordering you can always specify the angle by leaving a comment in the checkout process. Please provide the info by our angle method and be sure to reference which cables apply if multiple right angle XLRs are being purchased. After you have received your cable if the angle does not work for you, you can always change the angle yourself. Please be careful while making this adjustment not to hurt the wires inside the connector. Figure 3 shows the steps involved. Figure 4 shows the notches and the tab that locks them in place. Alternatively if you need the connector to fall in the 90-270 degree angles, the connectors can be modified to do so. For an extra charge we can cut a new notch at the angle you would like. We can cut these notches anywhere in the 90-270 degree range except for around 200 degree because that is where the tabs are that hold the connector together. Because of the factory notches we cannot cut extra notches between 270-90 degree. Please let us know the angle you would like and we can let you know the cost of this modification. Please keep in mind that we are not a metal shop and these are small and hard to cut cleanly there could be small scratches or nicks from this work. You should be aware that when modified it can affect the latching of the connector. Figure 5 shows two options at 180deg. 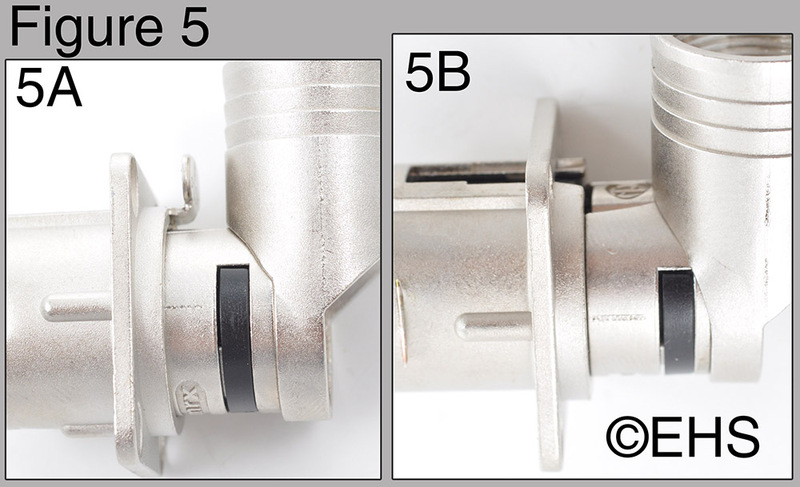 The male connector (5A) will cover the release latch making it hard to unplug. The female (5B) has its latch pressed by the body of the connector so will either not latch at all or may latch a little and the latch may be very hard to press in to release. I hope this info page helps. If you have any questions please contact us.